It has been a few years since I have attended the Vermont Quilt Festival. But this past weekend, I was able to spend three glorious days soaking up quilts, classes and vendors. I even had the treat of seeing the show with a dear friend , Lynne, from Vermont as well. The first class I took was taught by the lovely and funny Katie Pasquini Masopust and titiled “Color”. 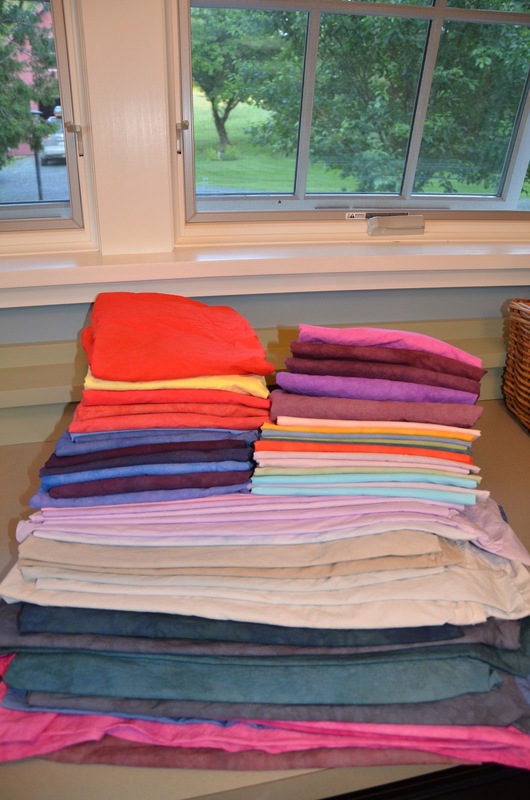 We were asked to each bring 100 squares of fabric for the exercises. The first thing we did was a color wheel aiming for the most pure colors we could find on the table. Not so easy even though you know the color wheel. Or do you? We compared our results and the results on black, white and grey. Then we developed a mini composition with one grouping of the colors. Analyzed magazine photos with regards to the colors that were used. Interesting to see how many colors we were missing even though there were at least 2000 colors out on our table. And then moved on to the next day’s class which was composition. More on that class tomorrow. Another great teacher. Sigh. So much to know but oh so good to have the opportunity to take all these classes. Working on a baby quilt for a friend and a graduation quilt for my daughter this week. And overdyeing last week’s bad ones. This entry was posted in Vermont, Vermont Quilt Festival on July 2, 2013 by Colleen Kole. One of my favorite things to do watch here other than the sunsets are the farmers cutting the hay. It has been a busy time on the fields around our home. We are here about two weeks earlier than last year and I am enjoying some of the blooms that I usually don’t get to see. 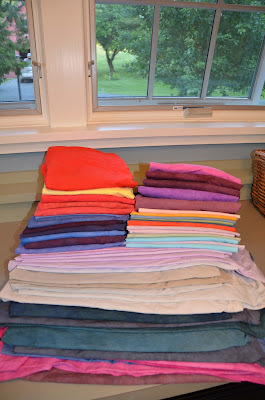 After about three days of getting settled in and walking around in kind of a foggy mood from the last month, I wanted to get busy dyeing fabrics. So I set up my dye studio. Only to struggle with the process and colors. I wanted deep dark purples and ended up with lots of mottled and tired darks. I think I didn’t make my soda ash solution strong enough. Or I have old dyes. I was unimpressed with my results with my results from the 50 yards I dyed. I overdyed about 15 yards and the darks still look washed out and grainy. 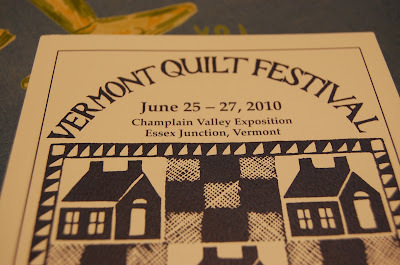 Good thing I am going to the Vermont Quilt Festival this weekend for 3 days. I will have to replenish the dyes to see if this helps. This entry was posted in fabric dyeing, Vermont, Vermont Quilt Festival on June 26, 2013 by Colleen Kole. I arrived in our second home in Vermont on late Wednesday night. Early Thursday morning, I got up early and drove to Essex Junction for the Vermont Quilt Festival. I had signed up for two small workshops the first two days and arrived to find I didn’t have the right supplies-the festival catalog had misprinted a few of the classes. The class I thought was Thursday was actually Friday. So I scrambled and went on a quick shopping and borrowing spree from my classmates….and rallied. I settled in to a day long workshop with Sonya Barrington on small works of silk. More on that and the other class in the next post. I promise. 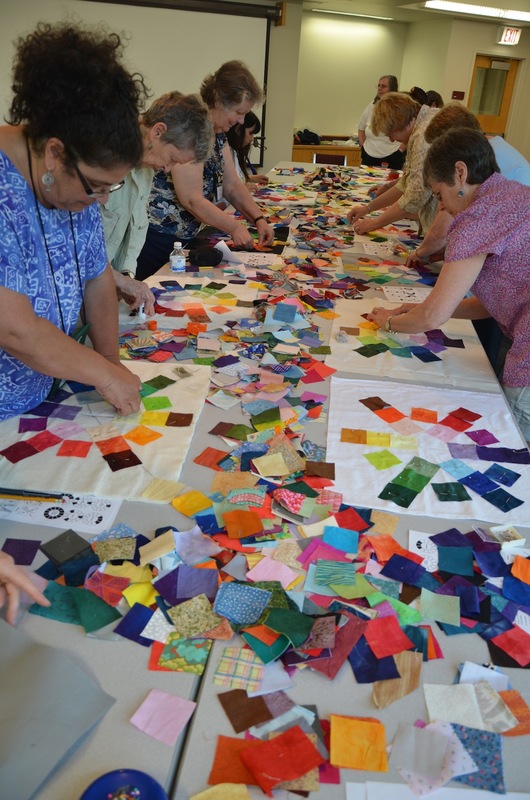 Overall, the Vermont Quilt festival was very busy and very well attended. I think it was the busiest I have ever seen it and the rainy day probably helped. I thought in all my years of attending, the show itself was very good. Primarily, it has had an abundance of traditional quilts but this year, there really was a nice variety. Also, there was a special exhibit of Vermont art quilters- one of whom I had met at the Barn this last time with two of her pieces finished-Marilyn Gillis. The other artists that I can remember: Karen Kamensky, Judith Reilly, Pamela Druhen and Noah (he was only fourteen and I was so proud of this kid and I am not his mom!). Very, very nice to see them all. 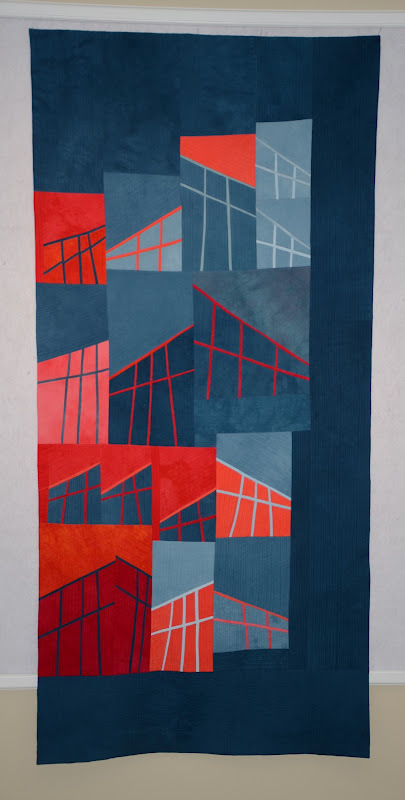 I was really excited to have won with this piece -1st place in Wall quilts and Best Contemporary Quilt. I never expected it and really my goal was to be brave enough to enter shows. 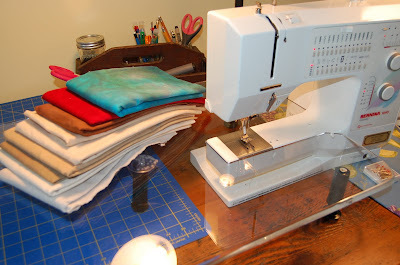 Now, I must get back to making quilts, right? I am being kicked out of the local coffee shop right now-sorry, I wanted to upload more photos for you. A coffee shop that closes at 5…mmm…back in Vermont. That’s ok. More later on the Quilt Festival. Be creative, my friends. The beginning of summer- I love it. What are you working on? This entry was posted in Vermont, Vermont Quilt Festival on June 26, 2011 by Colleen Kole. I have had an adventure beyond belief. I traveled from Michigan to Vermont for our summer vacation on Thursday. I was pretty excited to think that it would take me a mere 7 hours and my daughter and I would be there ahead of another portion of the family. (Various family coming and going all summer.College girl and grandma at home…very confusing- just trust me.) Well I was getting very smug with myself with the thought of big dogs riding in car with lots of stuff and husband driving. I would just jet in in less than a day. And be refreshed after a few days of pre chaos sewing. But, it took a mere 37 hours for me to get here. Yup-37 hours and involved missed flights, delays, an overnight adventure, a re-route to Washington,DC…and finally two days later…Peg’s Taxi. Which meant the end of our journey. And the beginning of our vacation. I came here earlier than the rest of the family to make it for the Vermont Quilt Festival. I went there today and had a great time. More pictures later when I can find wi-fi at the local library. Pictures take way too long to download with dial up service. I wanted to check in and let you know I am still here! I just need to sew to be a tolerable person to be around after that horrible experience. 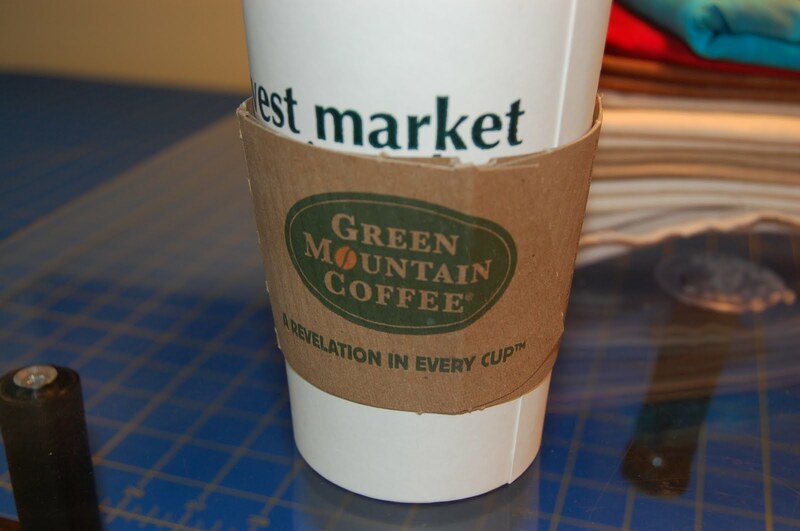 And have a cup of Green Mountain coffee. This entry was posted in Vermont Quilt Festival on June 26, 2010 by Colleen Kole.